What is the difference between the Mantis and Black Widow? Battery tray and standoff plates are interchangeable, and you can stack as many standoff plates as you like to hold all flight electronics, sensors, cameras, receivers, transmitters, datalinks, GPS, OSDs and other onboard equipment, providing some distance and shielding between them, so helping to minimise RF and magnetic interference. Motor mounts can be fitted to the top or bottom of the arm, or fitted in pairs to allow two motors per arm to be used. Plastic dome covers are available for the frame hub and can be fitted on both top and bottom (subject to equipment installed). They are RF transparent so will not interfere with your receivers, transmitters or GPS and are made of flexible plastic that is almost unbreakable. They are supplied with Velcro dots and straps for quick and easy fitting and removal, and come in a choice of four colours, red, blue, yellow and white. Camera mount adapters to fit PhotoHigher AV130 and AV200 camera mounts are available for the V Hexa and V Octo frame configurations. 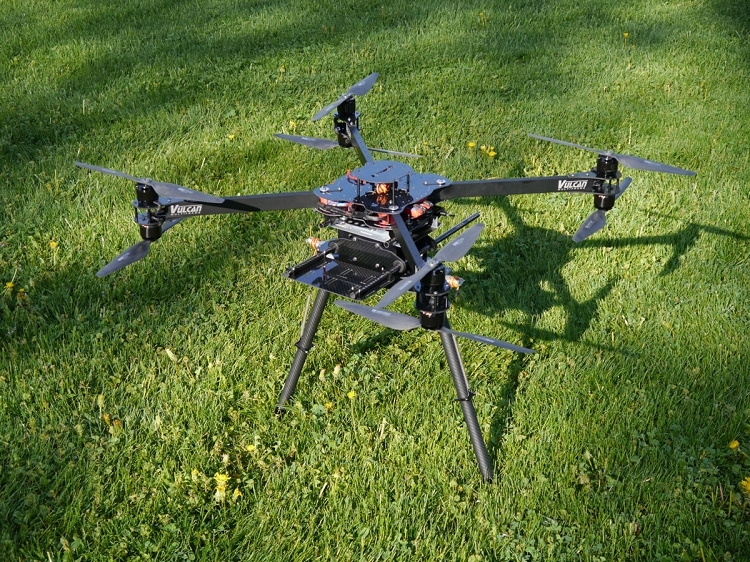 These hold the camera slightly forward of the centre of the frame, minimmising the chance of rotors appearing in the camera view, and the offset weight can easily be balanced with battery and landing leg positioning.